If you want Kava that is the very best available you need to start by buying from a source that insists on buying kava root directly from the growers so you can be assured that you are buying the very highest quality kava available. This whole kava root (absolutely no stems or leaves are used!) is processed into kava powder in small batches, assuring that you will receive the freshest kava available. The extra fine grind of this kava makes the preparation of the kava beverage simple and quick. Your kava comes in convenient re-sealable zip lock packaging that keeps your kava fresh. Every package label has the recipes and instructions to get the most from your kava experience. Kava is also known as Kava Kava. In Hawaii kava is called Awa (pronounced ava). In Fiji kava is called Yagona. In Pohnpei kava is called Sakau. Kava is a natural herbal beverage made from the root of the tropical shrub, Piper methysticin (kava). For 3,000 years Pacific Islanders have used kava to help them relieve tension and enjoy life more fully. Preparation: Kava is typically made into a drink that is consumed primarily as a tranquilizer to aid relaxation while purportedly not affecting mental clarity. Add some powder to water and blend then strain through a nylon stocking. There are other ways to mix your kava and even some delicious instant kava products that you only need to add water to and stir! Easy Breezy Beautiful!! Qualities & Properties: Peace, Calm, Anti-anxiety, Analgesic, Anticonvulsant. Sail away to the magical and mysterious Islands of Vanuatu. The Melanesian people of this South Pacific nation have ancient roots that reach back thousands of years. 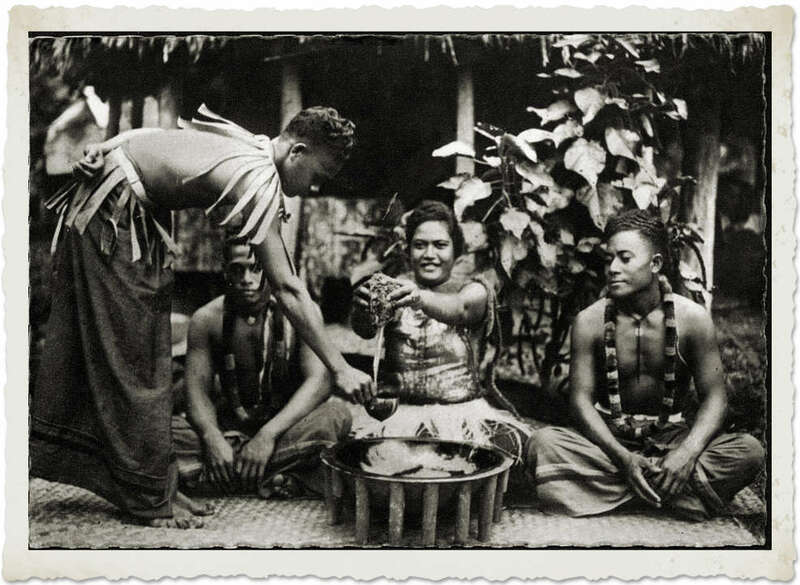 It is their ancestors that discovered and domesticated what we now know as Kava. There are more varieties grown here than anywhere else in the world. Vanuatu is legendary for its highly potent kava. Vanuatu law regulates that all kava sold for export must be at least 5 years old and be grown organic using no pesticides or chemicals. Only “Waka Grade” lateral roots (the most potent portion of the root mass) from 5-10-year-old plants are used to make this high-quality kava root powder. The relaxed sense of enhanced mental and sensual awareness this kava produces leads to a state of quiet contentment. Sit back and “Listen to the kava” as they say in Vanuatu. Extra fine grind makes for easy mixing and very little waste. One pound (453g) of kava powder makes approx. 12 quarts (11.4 liters) of kava beverage. Fly to a South Pacific Paradise of lush green tropical islands and unspoiled white sand beaches. Overwhelmingly beautiful, the Islands of Fiji are home to some of the warmest, relaxed, and friendly people on the earth. It’s not surprising that Kava is so highly valued in their culture. Used for evoking an atmosphere of relaxation and easy sociability, Kava is naturally their drink of choice. Throughout the Pacific, Fiji is famous for its fragrant and smooth tasting kava.We purchase only the highest quality Kava that Fiji has to offer. This extra special “Waka Grade Kava” is the most potent lateral root that is available in Fiji. Grown organically without pesticides or chemicals. A perfect elixir for an intimate gathering of good friends and good times. Kava relaxes the body while clearing the mind, creating a state of natural well-being. The tranquility that comes with drinking kava is said to evoke an atmosphere of easy sociability. It’s no wonder that kava as been used by Pacific Islanders to foster communication and even as a means to conflict resolution. Kava truly is “The Drink of Peace”. The effects on the mind and body are the ones you can expect from good kava; your lips and tongue will become a little numb, and then the effects of the kavalactones will work their way into your brain and body, leaving you feeling relaxed and happy. Kava Preparation: Kava is typically made into a drink that is consumed primarily as a tranquilizer to aid relaxation while purportedly not affecting mental clarity. Warning: Not for use by persons under the age of 18. Do not take kava if pregnant, nursing or taking prescription drugs. Never use kava simultaneously with alcoholic beverages. Common Uses: Kava is typically made into a drink that is consumed primarily as a tranquilizer to aid relaxation while purportedly not affecting mental clarity. Try it! You won’t be disappointed! This kava is premium quality and very potent. 1 pound of Kava Kauai can equal 2 pounds of some other kava brands. Polynesians have been drinking kava root beverages that have been made from roots farmed and processed the traditional way for more than 3000 years! Kava Kauai sells the pure kava root powder that is not a modified or extracted variety, they use traditional methods in the production of their kava. The kava puts our mind at ease and fills us with aloha. We are so thankful for all we’ve got. We have a lush forest with vinegar trees, and it can look pretty tropical when they are in bloom! The birds like the water garden and they come to drink and bathe. We like to talk about our memories of Hawaii and enjoy the warmth of the same sun!! This kava is very strong! Probably more potent than the Premium, but the taste is very strong also. You won’t like drinking this one but you’ll feel the effect – sometimes even the next day! You can always use less kava powder to make a drink of “regular” strength. Kava is used as an effective natural herbal remedy that may help reduce anxiety, stress, and muscle tensions, promote friendliness and sociability and produce relaxing physical as well as mental sensations. Its effects can be described as ranging from mildly sedating to mildly intoxicating, depending on the dose. ‘Taveuni Tonga Kava’ is grown on a remote island in Tonga. Not many people live on this active volcanic island, but farmers “commute” to work by boat, staying and working for several days before returning to family and home.anxiety,stress Makes a smooth and potent beverage, relaxing and intriguing. Prized throughout Tonga for its strength! Ingredients: Pure Taveuni Kava Root, Sun Dried. We love the instant kava mixes because you don’t need to run the pulp through a nylon stocking or blend it to smithereens! Just stir in some of the powder into your liquid and voila! Instant Kava that will knock your flip flops off! This kava paste from Kona Kava Farm is one of our all-time favorites! Small jars of golden kava paste, perfect when you need to drop a little dab under your tongue and take a ride on the peace train! The Kava Paste is root-only (no liver damage) C02 cold extraction technology, for an ultra-pure extract. One pea sized serving is enough for a relaxed and happy experience. There is a reason this is the National drink of Fiji; and with the liver damage reports proven false, you can indulge with confidence. FULL SPECTRUM KAVA PASTE: This latest paste is one of NEWEST favorites! It’s root-only (no liver damage) C02 cold extraction technology, but crafted as a FULL SPECTRUM extract, rather than an isolated Kavalactone extract above. 1-2 pea sized servings is enough for a relaxed and happy experience and gives you the full benefits and protection of the entire alkaloid content of the Kava Root.